This refreshing and easy Grape Salad recipe will keep you hydrated during hot summer days. You could also start your day with a bowl of this fruit Salad recipe in the morning, and you are good to go. This easy fresh fruit salad recipe is beautifully seasoned with a cream cheese dressing and infused with vanilla, so it is a lot like dessert with sweet and tangy flavors to it. The best part about this recipe is that it’s so simple to make and delicious to eat. You can add any fruit you want in this recipe and not just limit it to grapes. In fact, the more fruits you add, the merrier. For example, grapes go well with mandarin oranges. You can serve it in the place of a dessert or eat it as a snack. It is also ideal for a potluck or picnic. Make it interesting for kids using fun ideas like rainbow coloured theme by adding fruits of different colors. This salad will not only encourage kids to eat healthier but also makes healthy eating so much fun. If you’re someone who likes to lounge outdoors, then this easy, fresh fruit salad will keep you company. 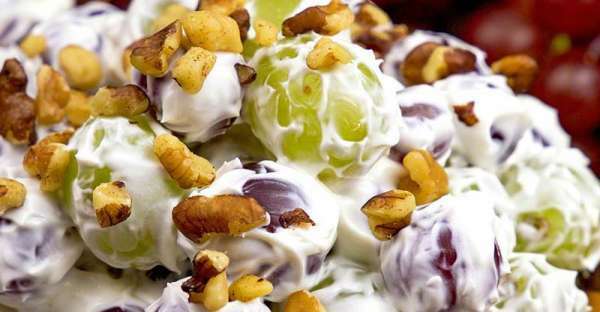 Thank you to Judith Hannemann at the Bake At Midnight food blog for sharing this yummy and easy Grape Salad recipe with us. Do visit Judith’s blog for more fun desserts and simple dessert recipes. This easy Grape Salad recipe is healthy for all fruit lovers. Make this delight today! USE THE NEXT PAGE BLACK LINK BELOW FOR THE RECIPE AND INGREDIENTS.